“I’m running away to Paris to be a writer!” I jokingly texted to Shelley as I sat on the runway waiting for take off. With my journal in hand, I was giddy with excitement as I headed back to the city I once called home. Trips to Europe are not a common event in my life but a few months ago a friend from college offered me an airline ticket at a reduced rate. I was touched by her offer but figured I wouldn’t really take her up on it. Still, the idea kept coming back to me. It had been 11 years since my last visit there, 20 since I studied there as a junior in college. Could I really do this? Airbnb has made travel more affordable. My partner, Stu, was on board. Maybe I could actually pull this off? 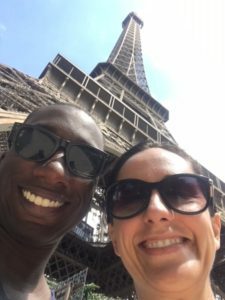 At about the same time that going to Paris became a possibility, our Lit Coach Connection website went live and I began blogging regularly for Two Writing Teacher’s Slice of Life Challenge. Writing made me pay more attention to life. Soon writing ideas came easily to me and I saw everything as a blog post. I noticed that I paid closer attention and lived mindfully. I loved the sense of community that came from posting my writing, receiving feedback and reading and responding to the writing of others. For the first time, I identified as a writer. Suddenly going to Paris has a new purpose, I would go to write. Afterall, this is the city where Hemingway, Joyce, Fitzgerald, Stein and many other American masters came to write. Paris’ leisurely cafe culture, where one can sit for hours and hours, make the city an ideal home for writers. 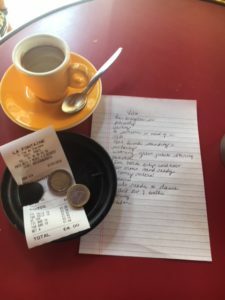 As Natalie Goldberg wrote in Writing Down the Bones, “…there are probably 5 cafes to every block in Paris, and they are beckoning you to write…” It is no coincidence that I felt the draw to write here. 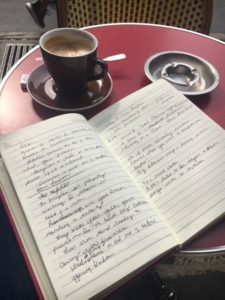 I began each day at the cafe on the corner with a cafe au lait, pain au chocolat, and my journal. I spent hours writing in at the brasserie by the park in the afternoon. The poem I left for my waiter. 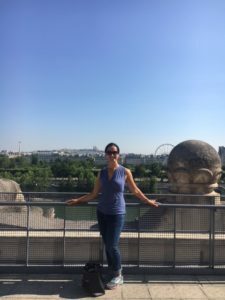 My week in Paris serendipitously fell during the same week that Jennifer Serravalo focused on poetry for her summer writing camp. I can’t think of a better genre to explore in this stunning city. My routine was to watch Jennifer’s daily lesson in my apartment and then set out to the cafe to try out the technique she demonstrated that day. I wrote about what I saw on the corner of Faubourg Saint Antoine and Rue des Charonnes. I wrote about the revving of moped engines and beeping of horns and the feeling of squeezing in between two people to take a seat at my tiny circular table. I wrote about my realization that if I was going to hang out with locals, I had to accept the constant cigarette smoke that drifted my way. I wrote about the music of the French language and occasionally eavesdropped on conversations. I described the butter that burst forth in each bite of my croissant. Right next to my table was a stand for the Velib, the name is a combination of the words “velo” which means bicycle and “libre” meaning free. I wrote a poem about the Velib and, inspired by Jennifer’s call to share our poetry, left it for my waiter. From the rooftop of the Musee d’Orsay. One morning I went off to Musee d’Orsay by myself and realized that I prefer to experience art museums alone. I like to walk into a room, sit on a bench, take in all the art in the room and select 1-2 pieces to study closely. My favorite thing is to wander around Paris. I walked miles and miles each day but I listened to my body and took time to sit. I also risked looking like a tourist and wore sneakers. The World Cup was happening when we were there. We must have watched 5 games, including the match with France and Uruguay, in local brasseries. I loved how locals would gather on the streets surrounding the brasseries for a glimpse of the score. The collective cheers and tension that comes with the communal aspect of being a spectator made me a sports fan for the first time. I filled the pages of my notebook with quotes, words I overheard, observations, daydreams of coming back here someday with my daughters. I collected metro passes, menus, tickets to museums and the bateau bus (a boat that takes you the sights via the Seine river). I wrote about the people we met, both local French and fellow American travelers, and what we learned from them. I wrote about my French speaking abilities and how in earlier trips to Paris, I would feel frustrated that my French is not what it once was. This time I accepted it and felt comfortable speaking as best I could. I experienced Paris mindfully because, for me, writing is a mindful act. All of these entries are incubating in my notebook and ready for my next writing adventure, our Lit Coach Connection’s summer writing group. So as I watched the city’s monuments pass by the window of the Roissy bus that took us to the airport, I realized that this city will continue to flow through me and out of my pen long after I board the plane for home. ← What a difference a year makes…. LOVE the sneakers atop the Musee d’Orsay (which happens to be my favorite art museum!). Anyone who has ever walked in Paris will understand the necessity of sneakers. Thank you, Stacey! I am glad that you enjoyed my little detail about the sneakers! When I lived there, you would never see a French woman wearing sneakers. I am glad that has changed! Paris has an uncanny ability to capture the heart and soul. It is constantly changing yet stays forever Paris. I love your piece. I understand every line, because I too have lived it. Next time you go, and there will be a next time, check out le Musee Jacquemart Andre on Blvd Hausseman (my personal favorite), and the much smaller Musee Marmottan (Monet) in the 16th. A bientot! Merci, Maribeth! I decided to include certain details like the “pain au chocolat” and “the Roissy bus” for my fellow Francophiles! I am delighted that you are spending 3 weeks there! How wonderful! Being there reignited my love for the city and I am confident that I will return soon and when I do, I will look forward to checking out the Musee Jacquemart and Musee Marmotttan!